Paul closes the letter where he began it. Grace. Do you feel the grace of the Lord Jesus is with you? In you. Flowing through you? Many don’t. 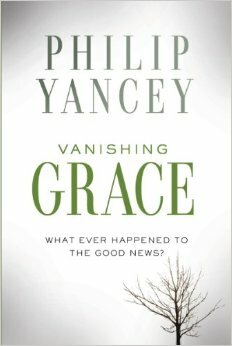 Philip Yancey just came out with a new book, Vanishing Grace. I’m looking forward to reading it. I thought about it this week at our Ministerium Bible study when the pastor leading discussion was talking about the salt of the earth passage from Jesus’ Sermon on the Mount. So you and I are the salt of the earth. In our day and age, salt is primarily a flavoring. That is a good comparison to how Christians could be the flavor of Jesus in this world. But in Jesus’ day salt was also used for healing and preserving. It was very, very valuable. Soldiers in the Roman army were often paid in salt, and in Latin this practice was called salarium, which is where we get our English word salary. Salt could help heal wounds. It could preserve meat. So there we have some more parallel to how Christians in the name of Jesus can heal and preserve our world. But how do we do this? One pastor at the Ministerium admitted that in his bi-vocation in the business world, his conversations about church, about sin, about Jesus, were not viewed as good salt. They were repulsive. I wonder if that is because grace is missing. Is grace missing from your life? From your attitude? From your words? Our world needs grace. We need grace. The message of Good News in Jesus is a wonderful message of grace. One way we are the Salt of the Earth is by being gracious! Think about it: We live in a cutthroat world. A world where grace is oftentimes missing. Our family has been watching old episodes of the reality TV Show Survivor. It is a game with lying, strategies of double-crossing, staying true to alliances only as long as they are self-serving. There is little grace. About his book, Philip Yancey says something that might be hard for us to hear. I urge you now to prayerfully ask the Lord if you need to hear this. He says “One reason the broader world does not look to Christianity for guidance is that we Christians have not spoken with a credible voice. Churches in my childhood focused on lifestyle issues such as hair- and skirt-lengths, movies, dancing, smoking, and drinking. Meanwhile, conservative churches said little about poverty, racism, war, consumerism, immigration, the treatment of women, and the environment. With some significant exceptions, the church sat on the sidelines of movements that addressed these important causes. He goes on: “Some further muddle the message of grace by piously casting judgment on society. I heard an all-too-typical example as I was writing this chapter. In the aftermath of historic floods in Colorado that damaged eighteen thousand houses, a Christian radio personality blamed the floods – and also our wildfires the same summer – on legislators who “encourage decadent homosexual activities, vote to kill as many babies as possible, and pass laws approving abominable idolatries such as marijuana.” Listening to those words as I watched water creep within inches of flooding my downstairs office, I easily understood how Christians alienate people. I could list scores of such moral pronouncements that foster an “us against the world” mentality rather than “us bringing grace to the world.”… How differently would the world view Christians if we focused on our own failings rather than on society’s? Yancey asks the question: “Why does the church stir up such negative feelings?” As the promo material for the book says, “He has been asking this all his life as a journalist. His perennial question is more relevant now than ever: in a twenty-year span starting in the mid-nineties, research shows that favorable opinions of Christianity have plummeted drastically—and opinions of Evangelicals have taken even deeper dives. “But people inside and outside the church are still thirsty for grace. What the church lacked in its heyday is now exactly what it needs to recover to thrive. Grace can bring together Christianity and our post-Christian culture, inviting outsiders as well as insiders to take a deep second look at why our faith matters and about what could reignite its appeal to future generations. When you’re appalled at the news coming out of Washington, out of the Supreme Court, will you ask God to fill you with grace? When the results of the election next week come in, whether you are cheering or moaning, will you ask God to fill you with grace? When your neighbor’s leaves blow onto your yard because he didn’t cover them, will you ask God to fill you with grace? When that kid at school is acting like a jerk yet again, will you ask God to fill you with grace? What does grace look like in a world without it? Reach out to the person who is being bullied. Sit with them at lunch. Talk to the office gossip who everyone can’t stand. We show grace by active and sustained involvement in Conestoga Valley Christian Community Services, where needy community people can come for food and clothing. Our CVCCS stand in the lobby can start to fade into the background and become part of the décor unless we actively seek to show grace. We show grace by preaching the Gospel of grace in both word and deed. If you know you are not filled with God’s grace, I encourage you to start doing gracious things: Forgive someone who doesn’t deserve it, remembering God forgave you. Treat someone with kindness when they have treated you poorly, remembering that God treated you with amazing kindness though you have sinned against him. Serve at CVCCS, a place oozing with grace for those who haven’t had a whole lot in their lives. Have you looked at all the opportunities to serve at CVCCS in the bulletin? Help pack shoeboxes for Operation Christmas Child on November 5th. Show grace to kids around that world that may have never experienced the grace of Christmas. Fill Christmas stockings for the kids Joe Toy works with in Philly, and then join the group going to Philly on December 13 to interact with the kids. Let us be a people that love God, love one another, filled with grace. Feel free to listen to the whole sermon here.